It doesn’t really matter if it’s winter or not wherever you are in the world, there’s never a wrong time to be playing any online slot and you’re probably indoors and out of the cold anyway. $nowy’s Wonderland – that’s the correct spelling – is a game developed by Random Logic, it features a progressive jackpot and it’s available to play at 888 Casino so read on to find out more. 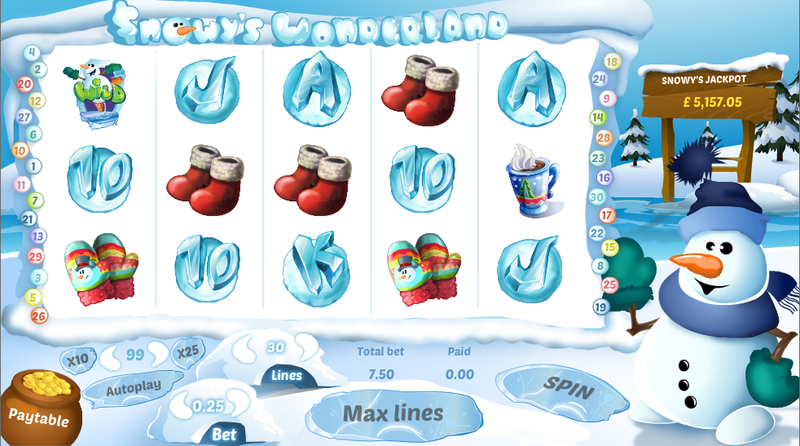 $nowy’s Wonderland plays out over five reels and thirty paylines and there’s no prizes for guessing that the theme is a chilly one. The background to the snow covered reels is features a bright blue sky above a frozen lake on which stands the current progressive jackpot prize. Frozen playing card icons are the low value symbols while the higher values are represented by a hot drink, a pair of cheerful mittens, some red boots, a sledge and a pair of skis. The scatter symbol is a little ice house complete with turrets and windows, the bonus icon is the sunglasses-wearing snowman, the wild is a leaping snowman and the skiing snowman is the second bonus symbol. This wild symbol offers a little extra and if you can land it on reel three it will expand to cover all positions on that reel. Any new wins created by the expanding wild will be doubled. If the wild does not expands it just means that there are no wins to be created by it. If you can land the skiing snowman on reels one and five on the same spin you will trigger this mini-game; just pick one of the symbols to reveal an instant prize. Three of the bonus scatter symbols anywhere on the reels will kick this game off and you task is to dress Snowy by picking items of clothing. There are four levels to progress through and the further you get the more you will win. You will see the current jackpot total on the sign to the right of the reels and it’s awarded randomly although the higher your bets, the greater you chance of winning the big bucks. If you’re here for the progressive jackpot then increase your bet as much as feel comfortable; you have more chance of winning the higher your stakes. This is a rather basic looking game compared to some of Random Logic’s other slots but the sheer number of bonuses make it very enjoyable. Well worth checking out.